A REALLY TRICK PART! 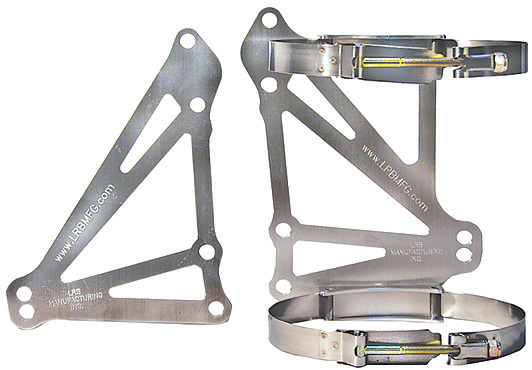 Completely reversible so you can mount your Oil Tank on either side of your Engine. Each Mount ties all the Bottom Engine Mount Bolt Holes up to the Stock Water Pump Flange Bolt Holes and this triangulates the Mount making it 3 times stronger, so you won’t be breaking off the Bottom Front Engine Mounts anymore. CNC machined from aircraft Billet Aluminum. Floating Stainless T-Bolt Clamps to securely hold your Tank. This Is An Awesome Part (Sorry The Picture Doesn’t Show The Fine Detail). It Is Very High Tech! !